Datto RMM creates a log of user activities carried out in the Web Portal and the Agent Browser. The listed items include security level changes, policy toggling, alert muting, Agent update authorization, deleting of a device, and much more. Account activities can be viewed on the Account > Audit tab. Refer to Account activity. Activities associated with a specific device can be viewed on the Device > Audit tab. Refer to Device activity. The activity log is a list that can display up to 100 records per page. It can be sorted by Date/Time, User or IP Address. The default sort order is Date/Time. Date/Time Displays the time zone, date and time when the activity was carried out. User Displays the username of the user who performed the activity. IP Address Displays the public IP address the user logged in from. Details Displays the entity the activity was performed on, and the action that was performed. Parameters Displays the fields and values of the affected entity. In the Users field, select a Username and click Search. To display the full list, select All and click Search. 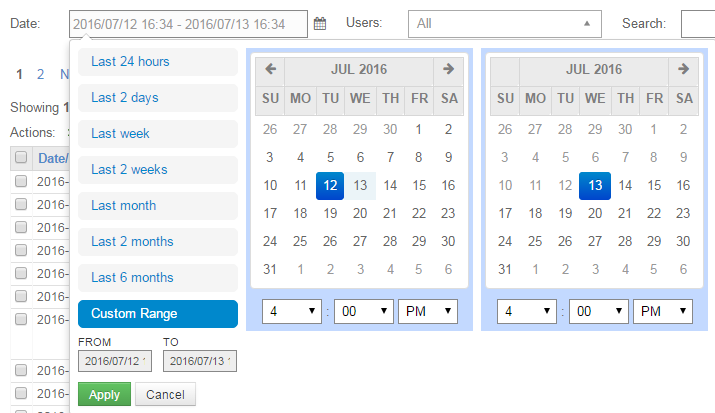 In the Date field, select the range from the list or specify a custom date and time range. To display the full list, clear the Date field. Search for the records you would like to export by performing one of the searches above. Select any of the activities. To select all activities, click the check box in the header row. Click the Export to CSV icon in the Actions bar above the list. Select the columns you want to export. Click Save. The file will be downloaded to your device.